Spyderco Dragonfly Photo courtesy of Gino Belleh. I love the Spyderco Ladybug for how small and usable it is, but I found myself looking for something a little larger, a little tougher, yet still in the genre of very small blade. Not as a primary EDC by any means, as I prefer a larger blade such as the excellent Spyderco Military or Para-Military 2 for that role. Rather, as a companion blade, to complement my primary EDC blade. The goal was to find something small, innocuous, easy to deploy for a quick task, and something that won’t instantly panic the delicate sensibilities of folks who can be uncomfortable around beautifully crafted and substantial blades such as the Military. As for edge, I prefer a sharp plain edge on my primary EDC for easy sharpening and versatility. So for the companion blade, I was looking for a serrated edge or SpyderEdge as Spyderco calls their very interesting serration pattern. Also it needs to be very light and very durable, much like the Ladybug, but again, a little more substantial. With all that said, the choice was quite obvious… the Spyderco Dragonfly. To mix it up even more, I decided to go with Spyderco’s H1 rustproof steel (made with nitrogen instead of carbon). Unfortunately this knife only comes in YELLOW! So, yellow it is! The package arrived, unceremoniously enough, via postal mail on a quiet Thursday afternoon. The little envelope waited patiently among the bills, offers, and other assorted mail pieces in my mailbox. After getting myself a drink, I tore open the shipping envelope, and cut the tape with my trusty Military. Yes, for the most part, the Military has a fairly cushy life here in the suburbs of North Dallas. And there, nestled in the neat little Spyderco box… sat this small, but decidedly badass-looking little knife. I picked it up, played with it some, cut up some stuff, and put it in my pocket. Clipped it to my pocket actually, since it has a clip (for now). This is significant… You’ll notice I didn’t say I dropped it on my desk or put it in a drawer. No, my initial feel was good enough that it went IN MY POCKET. As those of you who’ve read my previous reviews know, my pocket is the place of honor, to where only the worthy blades may pass. If I don’t love it, what’s point. This is one small knife… Compared to the Military. But this is one BIG knife… Compared to the Ladybug. 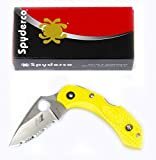 The blade is only a bit longer than the ladybug, but it has the excellent 50%/50% choil Spyderco features on many knives. Also the handle is larger than the Ladybug. The two features taken together allow you to get a far, far better grip on the knife, than would be possible with the Ladybug. Overall, surprisingly solid and capable little knife. The FRN material weirdly just feels good in the hand. No, the FRN is certainly not much to look at, which is why I was never attracted to the Endura, despite liking large, light knives. But when you handle it, you begin to understand the appeal. That said, I’m not clipping FRN to my pocket. It’s light! 1.2oz for a capable knife and locks open, can be easily opened with one hand, and actually offers an OK grip, all while being very small. It’s small! Sure, not as small as the Ladybug, but still well small enough to free float in my pocket. You could say it’s a Ladybug on badass steroids, which is precisely what I was looking for. The grip one gets on this knife is far, far, far more solid than the Ladybug. It feels good in the hand, quite usable. I’m able to actually flick this knife open via the Spyder hole. Awesome. That was after a bit of practice, and I’m still going to add a drop of Ballistol just to ease things up a bit more. But it CAN be done. Something I haven’t been able to do comfortably/safely a Ladybug, just not enough purchase for me. The yellow. I get it, highly visible, easy to find if you drop it… but damn. Color is such a personal preference, and I’m not sure how many other ways they could have gone with this, but I’m really not feeling the yellow. Yes, I saw the pictures, they represented the color accurately, I ordered it, I knew it would be yellow. * Note: read on, the yellow took an interesting twist after a few days. That’s pretty much it, excellent knife. There is one final, but noteworthy problem with the Dragonfly that has to be mentioned. It’s the elephant in the room, so to speak. This knife is a gateway drug for Spyderco Serrated folders! Not 3 days after receiving this knife, I had already ordered the Tasman Salt Serrated (which I’m REALLY enjoying, far more than expected – review coming soon). The first thing I noticed by day 3, is that the Dragonfly was still in my pocket. Actually IN my pocket, and it has kicked out the Ladybug, it’s that useful to me on a daily basis. I will say this is a personal preference… the Ladybug would be a better fit for some situations, but for me, the slightly larger Dragonfly is just a better fit. Than again, let’s remember I like the Military, so I’m not a tiny-knife-only kind of guy. Weirdly, the yellow is growing on me. As shades of yellow go, Spyderco did an excellent job choosing a nice one. My problems with the yellow disappeared when I realized what my ONLY problem was with the yellow… having something yellow and plasticky (FRN) clipped to my nice jeans. While I’m not going to have this knife clipped to my pocket with the yellow plastic hanging out (not gonna happen lol), as a standalone knife color, I’m not sure there’s a better choice for the FRN material. The yellow looks better to me than their black and other color options. Frankly I kind of like the yellow… now that I understood my problem with it. Clipped to your pants, with yellow plastic sticking out, it just looks bad (to me). BUT as a free-floating in your pocket companion blade, I kind of like the yellow. It’s definitely ok. 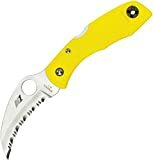 In fact, I liked it so much, that I just ordered a Spyderco Tasman Salt Serrated, also in the same yellow. Color and style drama aside, This is one really handy knife. Glad I went with the serrated option, this way I have both edge options… plain edge of the Military, and serrated edge of the Dragonfly. Loving the Dragonfly. Hasn’t left my pocket the entire time, it’s that useful. I understand now why Spyderco refers to this as a “little big knife”… because it does far more work, and does it far more competently, than one would expect from such a tiny knife. And of course the build quality and ergonomics are what we have come to expect from Spyderco. As some on various knife forums have remarked, this is a “go everywhere” knife, there’s no reason to NOT have this knife with you. It’s small enough to be THAT portable, yet it’s large enough to actually be useful. It’s easy to see why Spyderco calls this a “little big knife”. Excellent little knife. Surprisingly handy, and small enough to always be there. Get one. The Spyderco Dragonfly sits neatly in the middle ground between the ultra tiny Ladybug, and the larger Tasman Salt Hawkbill. Here’s a comparison between the Spyderco Ladybug, the Dragonfly, and the Tasman Salt. Spyderco Tasman Salt Serrated (review coming soon). If you’re willing to go bigger, the Spyderco Tasman Salt Hawkbill is a formidable little knife, tho a little bigger than this one. The hawkbill style blade actually provides surprising utility. It also makes a great gardening and utility knife. If you want smaller, there’s only one viable choice, as far as I’m concerned. And that is the Spyderco Ladybug. The Ladybug also comes in several variations: Plain Edge, Serrated Edge, and Hawkbill Serrated Edge. Seriously thinking about getting a Hawkbill Ladybug (yes, in yellow!!) to replace my regular plain edge Ladybug.